Is it over? Please tell me it isn’t over. I have decided that Stephen Lloyd Jones doesn’t get enough literary attention. I don’t hear about his books as much as he deserves, and when I bring him up myself, I get questions like “I haven’t heard of those novels – are they good?” Yes. Yes, they are. I’m a tough reviewer of anything that smacks of otherworldliness, but I happily give 5 enthusiastic stars to the latest installment in The String Diaries chain. I see via Twitter that Mr. Jones has sent a new book to his publisher this summer, which is just enough information for me to relentlessly keep checking for his next release date. Just as a side note, here’s my review of his first novel, The String Diaries. Picking up 15 years after the close of The String Diaries, Written In The Blood follows no fewer than five characters. Each one brandishes an incredible backstory, and each one is uniquely marvelous in his or her own right. I should note that these clever characters are both good AND evil. This is the brilliance of Stephen Lloyd Jones’ writing. His characters are both immensely complex and wonderfully unpredictable. You’ll come away from this novel with just as much appreciation for the determined Leah Wilde as you will for the generations-old creature Jakab. In The String Diaries, Hannah Wilde and her daughter Leah are hunted by the ghoulish Jakab. Thanks to the shape-shifting talents of several characters, the reader is never quite sure who is dealing with whom. The question of trust coursed throughout that first novel, which culminated into a fantastic ending. Written In The Blood, on the other hand, examines the efforts of Hannah and her now grown daughter Leah to keep their people’s lineage going. The numbers of these supernatural people are dwindling, and their efforts to repopulate are met with both joy and fury by their extended community. In addition to this, Leah is also mercilessly hunted by the tolvaj, which is a centuries-old creature that feeds on the souls of shape-shifters. But how do you watch your back when you’re pursued by a supernatural creature? The book kicks off with Leah leaving her mother’s side so that she can reach out to dangerous elite members of their community. If she does not get some buy-in from them, then their efforts might soon be wasted. As she enters the vast, secluded mansion of someone who should be her enemy, you realize that this plot wastes no time. Within just a few pages, you’re off and running with this story at a break-neck speed. Leah’s race to fight hosszú életek extinction runs parallel to several other plot lines. These other stories could be standalone novels, but here, they are expertly linked to the main thread. As Leah works toward rebirth and the stabilization of her people, the novel’s other characters are introduced. Some we know from The String Diaries, and some we meet here for the first time. One of these characters, Isak, is a sweet and loving man from nineteenth century Budapest. Isak’s plight in this novel is to find his daughter. Having lived a longer life than you or I could possibly imagine, Isak’s devotion to find his child is marred by the fact that he also must destroy her. Stolen from him when she was just a little girl, she’s now something that is beautiful and grotesque in equal measure. The fact that Isak must destroy his daughter sounds heartbreaking, but believe me when I tell you that you’ll root for her demise. She’s plucked right out of a horror film. Wait… did I forget to mention that Isak is the younger brother of Jakab? Sorry about that. Back to my review. I could prattle on about why each character needs your undivided attention, but that would take away some of your enjoyment. Suffice to say that this is a fantastic, gothic thriller that has the power to scare the daylights out of you and still lift your spirit in the end. Don’t ask me how the author managed it, because I’m still trying to figure out how I wound up being simultaneously frightened and verklempt at several points during the story. Jones has created timeless (no pun intended) characters with an incredible plot, and has masterfully woven in Hungarian folklore. It’s intelligent, and wickedly fun. I recently recommended these books to a co-worker, and was delighted to hear that not only did he devour the tale, but he passed on the recommendation to another soon-to-be fan. I predict that Written In The Blood will be one of my top reads for 2015, not only because of the smart plot, but because of the strong characters. I almost get tongue-tied when I think about how well this author represents formidable female protagonists. Hannah, Leah, Etienne and so many more of this book’s people are willful, brilliant and fearless when it matters the most. Well done. 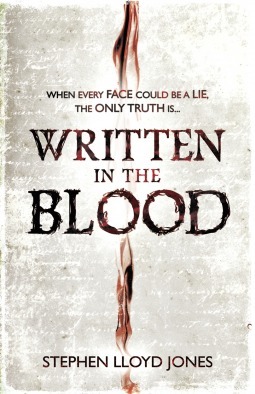 5 enthusiastic stars for Written In The Blood by Stephen Lloyd Jones. And now…. I impatiently wait for this author to tell me what happens next.